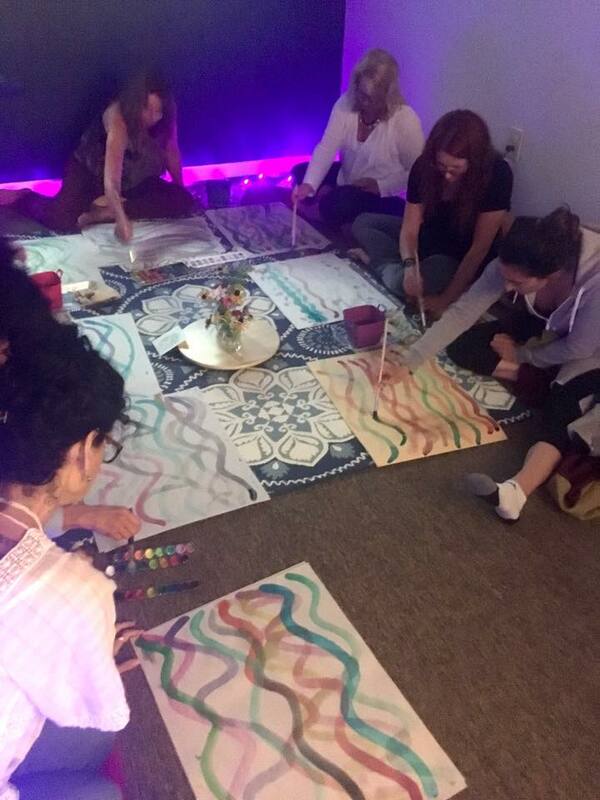 Would you like to play with glow-in-the-dark markers or kinetic sand while cozied up in a room that may include black lighting, music, and the vibrant color indigo? Indigo, the color psychologists say is associated with intuition and self-expression, is a combination of deep blue and violet. It’s also included in the name of Indigo Art Therapy Studio, co-founded by Kelly DeSousa and Sarah Beaman, my daughter in law. 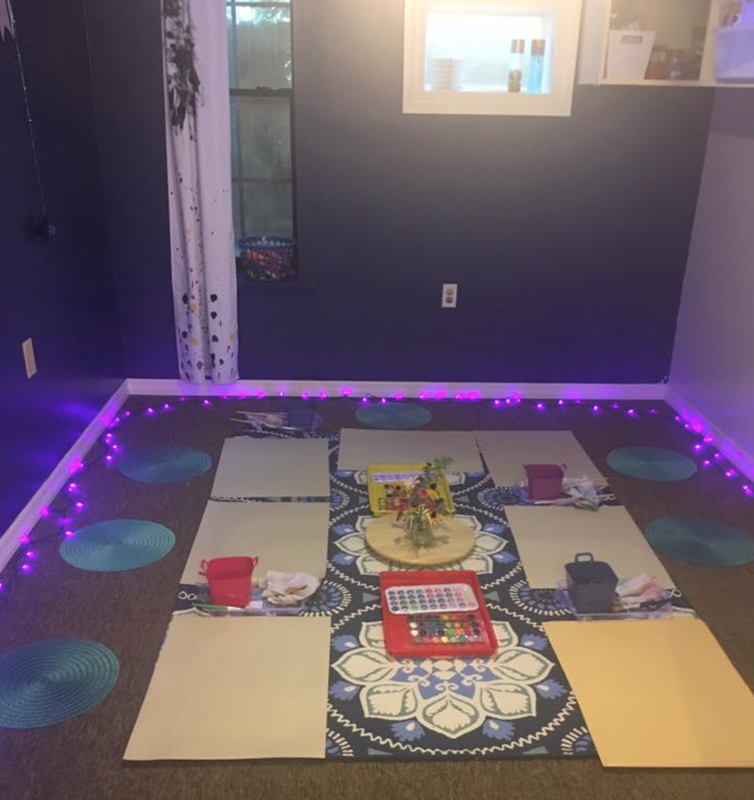 Located in Jacksonville’s artsy Riverside district, Indigo Art Therapy Studio enables individuals to learn how to create their own healing through art therapy, yoga instruction, and personalized mindfulness practices. 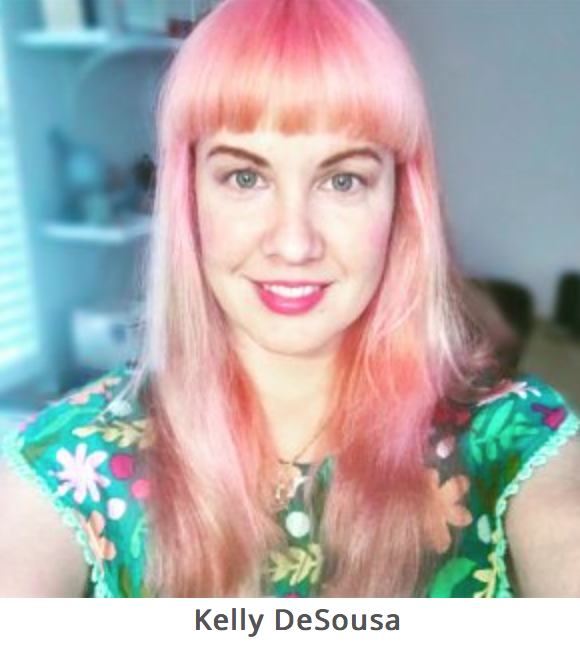 Like Kelly, Sarah is a master’s level registered art therapist and certified ESE (exceptional student education) teacher. She has also served as CSS Site Coach (Autism) for Duval county Public Schools. I met Sarah as our son Joel’s girlfriend when both were art majors at Florida State University in Tallahassee. After they married in 1996 and moved to Chicago, they took turns getting graduate degrees, hers in art therapy from the School of the Art Institute of Chicago. 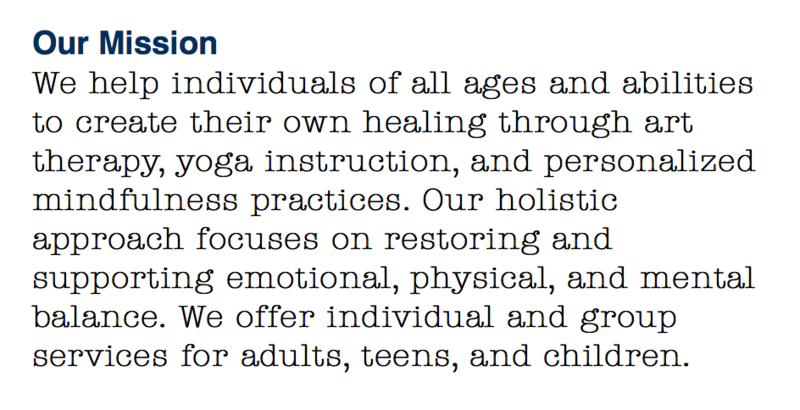 MLB How did you come up with the name Indigo for your art therapy practice with Kelly? SEB We liked the idea of self-expression and creativity that the color indigo suggests. MLB You and Kelly have an art therapy studio now, but when you first came to Jacksonville you had a different job. Tell us about how you got started, Sarah. What has been your career path to this point? SEB Ever since age 18, I have always worked with children and teens, beginning as a camp counselor – helping by listening and guiding. After I got my master’s degree, my work with youth has always included art. MLB You design workshops using paper with crayons/markers, special lighting, and mood music. Couldn’t every one set up an art therapy studio like this and invite in clients? SEB Art therapists have specialized skills. Practitioners need to know what materials evoke certain responses from each client. It takes training and practice to know that. MLB Your invitation to clients is all-inclusive. Yet many of your clients have special needs. Can you name some of them? SEB Our specialty is helping children with autism and related disabilities including low self-esteem, post-traumatic stress disorder and depression. MLB After you conduct an assessment, you design a therapy plan. What might this plan include, say for a child lacking coping skills? SEB We might start with colored markers. Or we may use calming exercises like deep breathing, working with clay or squishy sand. MLB Do you serve older clients too? MLB What activities would you use with a client, say one with trauma? Or with memory loss? SEB Here’s an example: We can have clients paint with tea bags. The smell may bring back memories of past experiences. Fantasize with the Mermaid Pillow! We use allergen-free materials, focusing on a tactile, sensory-rich experience. Before we start a session, we set out materials, observing what a person is drawn to. We recommend creating a sacred space in your home for children to be allowed to make messes. Everyone is an artist but not everyone wants to do art as a career. Find Indigo Art Therapy on Facebook for lots more color and sound. What other questions or comments do you have for Sarah or Kelly? Are you familiar with art therapy? Is there a studio in your town? Good morning, Marian. Thank you for sharing this art therapy center. I know of art therapists, but I haven’t seen a center, such as this. It makes me want to go in and play with color. There seems to be a public awareness of the importance of art for both pleasure and healing. For example, there is the growth of adult coloring books and painting events (often with wine), but at the same time funds for art are being cut. Sarah and Kelly’s studio invites all ages to come play while they express their imagination. At first she catered to children, but now I see lots of adults, women mostly, joining in. They don’t expect government funding. This is their own enterprise which they under-write with creative marketing and word of mouth. If you were in Jacksonville, we could go together to play with color, Merril! Thanks for introducing us to Kelly and Sarah, Marian. I’ve heard of art therapy, especially as it pertains to Alzheimer’s patients. When I get stuck in my story, I love to break out my coloring book. Yes, sometimes one form of expression feeds another. I think I go to my kitchen when I feel stuck although Joel and Sarah gave me an Alice in Wonderland coloring book with the John Tenniel illustrations. I always feel as though I have to color inside the lines though which probably doesn’t bode well for getting un-stuck. I enjoy our meetings here and on your own blog every week. Thanks, Jill! This sort of therapy looks very attractive to me. I have a teen acquaintance who struggled deeply with depression. This past year she took an art class in high school and began to show her considerable talents in painting. It has proved very healing for her and I attribute “art therapy” to the positive changes in her outlook. Your story is proof of the pudding. Working on the right side of the brain, apparently, calms the analytical, obsessive side. Thanks for this heart-warming anecdote, Luci! They began in February and have reached out via their website and Facebook pages. I hope you’ll check them out – more color there to stimulate your eye’s rods and cones, Jenn! What a great place. I used to work as a mental health counselor with young children, and art, including all the use of sensory materials and inputs, is highly effective on so many levels. Fantastic. Thanks for sharing, Marian. And thanks for sharing, Diana. Even during my formal teaching days, I knew that engaging as many of my students’ senses as possible would lead to deeper learning. Of course, I used colored chalk during lectures and walked students to learning lab for a tactile experience. Students arranged in circles worked in groups often. I so enjoyed this Marian thank you! All best wishes to Sarah and Kelly in their ongoing creative efforts towards healing and expression for so many. I know that Jung said something along the lines, that when one is stuck or in a status quo situation or feeling unhappy or just plain out of sorts, then let the hands do the work that the ego cannot. I know that this is true for me. And indigo – just this morning I was driving around and noticing the blue blue winter sky, and remembering a post I put up many moons ago “Colour me Blue”, and also remembering something I saw a few times on FB some weeks back of how different colours of blue have been found to be in use in ancient Egypt and coming back into use, and here is your post on indigo! My favorite line in your comment: [W]hen one is stuck or in a status quo situation or feeling unhappy or just plain out of sorts, then let the hands do the work that the ego cannot. Amen to that! Ah, Susan, memory is a tricky thing, especially “recall”! Marian — Thank you for the beautiful introduction to Kelly and Sarah and their valuable work at Indigo Art Therapy Studio. A holistic health practitioner, I applaud the tremendous recognition that art therapy is receiving for the positive, uplifting, constructive, and healing impact it’s made in so many people’s lives. When Sarah and Kelly chose the color Indigo for the studio, I immediately thought of the color analysis in your book. And when when Sarah agreed to be interviewed, I knew this post would resonate in big waves for you. Thanks, Laurie! Very cool! Creativity, whether it’s visual art, movement, music, or writing are necessary ingredients for healing! And in your case, art feeds your writing and vice versa. I clearly remember your references to painting and making collages as you tried to maintain sanity taking care of your mother in her later years. Reflecting on your book, somehow blues and yellows stand out prominently in my mind. Yes? “Making a mess” always appeals to me, though my ‘efficiency judge’ often steers me in other directions. A cardinal rule in Sarah and Kelly’s studio is lack of judgment. For them, process is way more important than a pleasing final product. “Paint away, Dolores!” I think Sarah would urge. Congratulations to Sarah and Kelly. One of my closest friends is an expressive arts therapist and my teacher Marion Woodman always co-led workshops with a woman who worked with art and mask making and another who was a dance therapist. I’ve found so much comfort and understanding through painting images and feelings, memories and dreams. Also, clay, but not some of the other materials used at Indigo Art Therapy. May the studio and their clients thrive. Yes, Elaine, I had never heard of squishy sand either. Both Sarah and Kelly will be thrilled to read your comment here along with those important good wishes. Thanks! I know from your response to my query on FB about liking adult coloring books (or not) that normally you don’t have time for coloring per se; but your theme and question here make me want to revisit that, especially after conducting the coloring workshop (related to my FB query) at our recent church convention. The timing for the workshop–at nearly the end of a busy, full, and sometimes tiring week–chock full of input from amazing speakers, singers and various leaders–was perfect. I could feel the exhaustion, tension, and stress receding as I walked around the room and sat at my table, also enjoying the quiet moments (no coloring pencils were left for me to use!). Your photos here remind me of that breathe in-breathe out atmosphere. How fortunate this duo is to have such a studio, and derive income from it! The coloring books I’ve seen call me to stay within the lines – that, and the idea that I’d rather be reading or writing hinders my enjoying of adult coloring books. A blank sheet of paper, for me, would be more alluring I think. Maybe an Amish coloring book from MennoMedia would do the trick for me, Melodie! I’m glad they can earn a living while doing something they love and enriching so many lives. Would that all careers were so fulfilling! Well, Rebecca, this is a fledgling business and both have other sources of income. Sarah, for example, is a public school art teacher in Duval County. I think they are at the break-even point right now. They love what they do at the studio, that’s for sure, Thanks! Your daughter-in.law sounds like an amazing person. How lucky you are to have her in your lives. 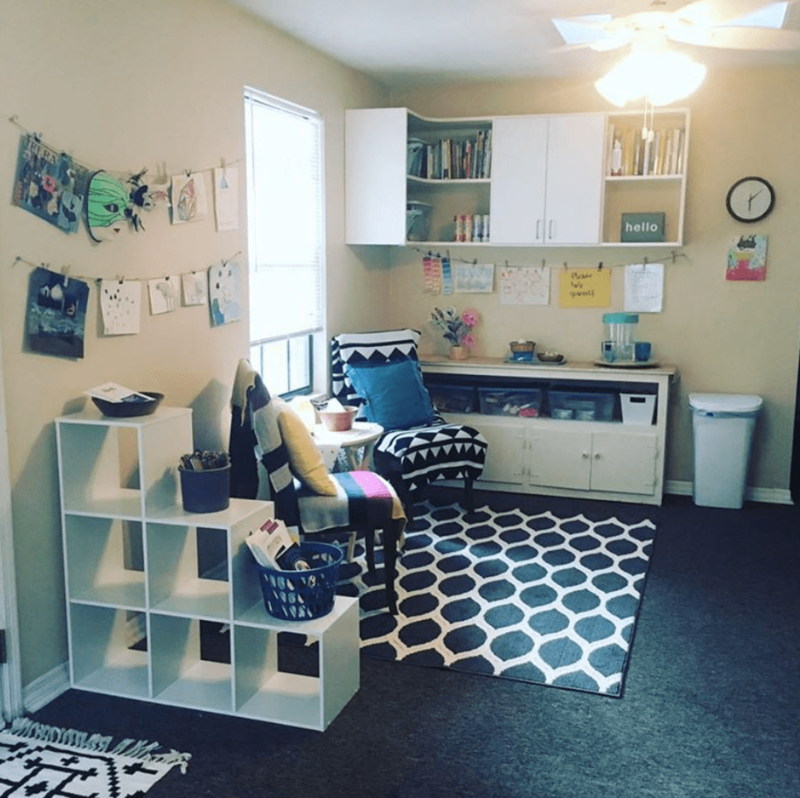 Her Art Therapy Studio sounds and looks so inviting. I have long been a fan of art therapy. When I worked with youth at risk we did a lot of colouring and collaging etc. It really made a difference. Thanks for introducing us to Sarah and Kelly. and the amazing work they do. You sound like a kindred spirit, Darlene. I can imagine Sarah (and Kelly) smiling when they read this. Thank you! I haven’t participated in any events at my daughter-in-law Sarah and Kelly’s “visual/emotions” studio yet, but I can confirm that even though I’ve made art into a business for many years I still find that I MUST be involved in some creative project all the time–or I feel like I’m shuffling and hobbling through life! Continued success for the Indigo Art Therapy Studio duo! 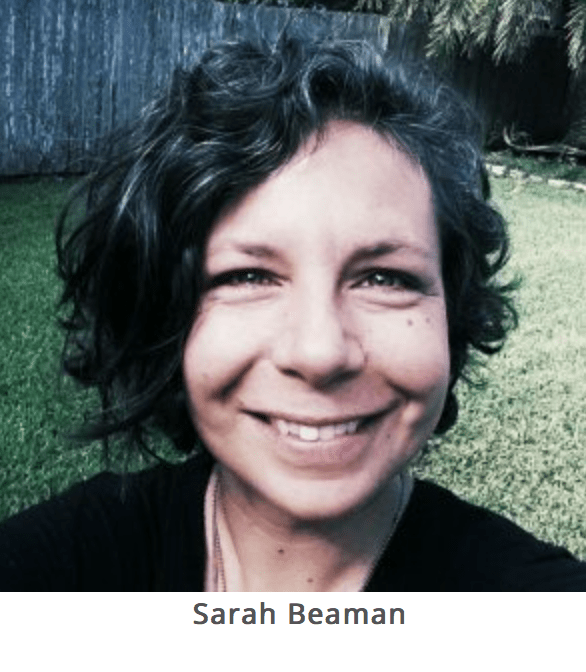 Sarah can probably say “Amen” to that, observing as we have her artistry at home in the kitchen and her embracing change throughout her art career here in Jacksonville. Hello from beautiful Colorado where we are visiting my daughter and son in law. What a wonderful article! Art therapy is such an under-rated and under-appreciated discipline! It reaches to places that we don’t now exist within ourselves and invites us to healing! I have had the pleasure of working with several art and music therapists and their skills are surprising to many in our left-brained logical world. In a very gentle and healing way their therapy is an important part of effective medicine today! Recently, I have found myself drawn to color indigo, although I called it midnight blue. I have always been fascinated by the symbolic and emotional meaning of color and symbols in individuals, cultures and religious groups. In Christianity we use many colors and symbols in worship and teaching. When I used to help my father and mother set up the church for worship, I can remember my mother explaining the different colors of the bible and their significance for the church year. Also being fascinated by the many symbols found throughout architecture, painting, sculpture, dress and other aspects of daily life. Thanks for sharing, Marian! Wishing Indigo Art Therapy Studio the best! Two words have stood out to me in your reflection: gentle and healing. Sarah and Kelly are exactly that in their approach. Thank you too for pointing out the spiritual nature of color. 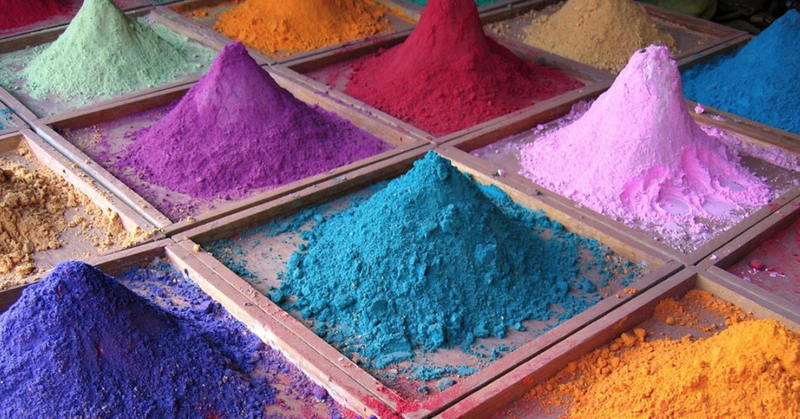 God’s world is not monochromatic but saturated with color which we too often take for granted. It’s good to hear from you again, Ann! Another synchronicity, Debby: Relatives through marriage who teach art therapy classes. Thanks for speaking up once again here! What a fascinating insight into the important work art therapists do. Fiona, I think that the photos with text on your weekly blog serve as therapy. I know they help me with self-care, grounded as they are in natural beauty and those doggies you feature too, animated beauty. Thank you for weighing once again! Interesting and clever. I wish them much success. Thank you for joining their cheering section here. Kelly and Sarah will read this and be encouraged. Much appreciated, Ann. What a beautiful and meaningful program Sarah and Kelly have created, especially in these chaotic times. Art in any form can be a healing balm. Best wishes to them for a thriving business. Thank you for sharing, Marian! Sarah and Kelly experienced a set-back this week, typical of a fledgling business with highly motivated entrepreneurs. They’ll appreciate your joining the stadium of well wishers that are cheering them on here. Thank you so much, Kathy. What an interesting venture Marian . How can colour therapy not work it’s speaks for itself . I wish them both all the luck in the world . I love Indigo , the colour , and the word even , so I ‘m sure it will attract people’s attention . Thank you for opening our eyes to it .